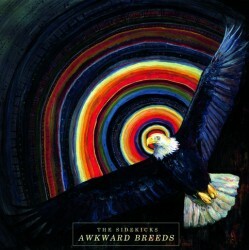 Cleveland, Ohio's The Sidekicks have always had it in them to make a record like this. It’s their most polished, mature, and best to date. There is not one bad track out of the eleven here. It’s musicality at its most honest. Singer/guitarist Steve Ciolek dominates this album. His falsetto singing is the best he’s ever done and he deserves whatever sheer warranted praise he gets for his voice. Not to be forgotten is second guitarist/singer Matt Scheuermann, who provides substantial backup melodies that help carry the album along without one slow, boring moment. There is energy here. It’s evenly filtered throughout the entire collection of songs and it shows immediately once opening track “DMT” starts playing. But then there is second track, “Grace,” and it’s even better—if not one of the best. What makes the song one of the best comes from the musicianship and arrangement of vocals. It’s competent, well played, and catchy: the right ingredients to make a good song. Things slow down a bit with “1940’s Fighter Jet” which proves to be the most emotional statement. The lyrical tone is one of stress, longing, shame and other tones of highs and lows. The layout is more somber and gentle, but then it builds to an almost epic climax before shutting off and keeping inside itself. Ah, but then halfway through we come to album highlight and what seems like the best Weezer tribute ever done called, “The Whale and Jonah.”—it sounds like how Weezer used to be. It has this grasp that’s straight out of the best, most infectious pop moments from The Blue Album and Pinkerton. And that isn’t even the stopping point here because the remaining tracks rock just as hard. The closing double punch of “Baby, Baby” and “Daisy” brings the whole project full circle, the latter song being a perfect closer, and with that, one of the year’s best albums. This album should be given to any and everyone around you. It has this breath of life that’s been missing in today’s music. There’s no BS here. This is a heartfelt and captivating album that should bring this band the due credit they deserve from the public. If that doesn’t happen, well… music be damned. Posted April 23, 2012, 9:45 a.m.